Each mobile carries a unique IMEI number provided by GSM and the mobile companies need to purchase each unique IMEI for their cell phones so this is how they found it expensive and do illegal work. PTA now has created a DIRBS system to check every IMEI number from all phones in Pakistan and provide messages to owners weather their device is complaint or not. PTA is acting now on this major issue where the IMEI duplication was found as most of the infamous mobile companies were doing so to low their expenses. Each mobile carries a unique IMEI number provided by GSM and the mobile companies need to purchase each unique IMEI for their cell phones so this is how they found it expensive and do illegal work. 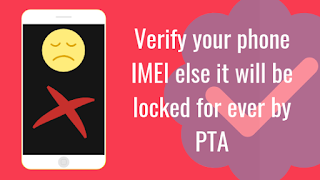 PTA now has created a DIRBS system to check every IMEI number from all phones in Pakistan and provide messages to owners weather their device is complaint or not. Device IMEI is non-compliant. Please insert all your SIMs in this device and use them before 20/10/18 date to continue using this device. You can only use one SIM in your phone from now because PTA will give you one IMEI so the sim which you mostly use put it in slot one. Device IMEI is blocked. Reported stolen. Your IMEI was reported stolen before or it was involved in any illegal activity so suggestion is stop using this phone and buy a new one else you will get arrested.